Mister Rogers arrives with a variety of items typically thrown away by most people. In the kitchen, he uses a plastic container and small pieces of sponge to make a toddler's toy. He also uses pieces of foam packing material as building blocks as he sings I'm a Man Who Manufactures. In the Neighborhood of Make-Believe, Corney and Robert Troll are trying to find a way to clean up the mess that has been made of the factory's water wheel. Dr. Bill is unable to offer any advice but Elsie Jean suggests that some stains are easy to treat, but "nothing short of magic" can remove wood stains. Lady Elaine Fairchilde arrives outside the factory with her boomerang and uses its magic to remove the stain from the creek and the water wheel. In order to prevent similar damage in the future, Corney decides that he will start using a dirt-based stain which could be more easily cleaned. Back at the house, Mister Rogers takes out a puppet made by Bob Brown from a detergent bottle. Wondering if others in the Neighborhood reuse items in similar ways, Mister Rogers visits the McFeely house. Mrs. McFeely shares a birdfeeder that Mr. McFeely recently made from a milk carton. Mr. McFeely stops in briefly to pick up a book for a delivery before Mrs. McFeely shows a few more creations made from used items -- a pillow made from an old sheet and a rug made of used fabric. Moving on to Brockett's Bakery, Gladys Schenk shows an old lard bucket used as a waste basket and describes how old bread can be used to make bread pudding. Coming from the gym, Chef Brockett suggests other uses for old bread including croutons, stuffing, or simply selling it at a discount. Returning to the house, Mister Rogers plans to make a birdfeeder of his own as he concludes for the week. 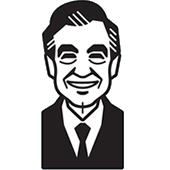 When Mister Rogers sings I'm a Man Who Manufactures the opening line is slightly altered: "I'm a man who manufactures. Who manufactures toys." Then he encourages children to be creative as he sings "I'm a child who manufactures. Who manufactures things." Chef Brockett offers to give a bag of three-day-old bread to Mister Rogers for free. Instead, Mister Rogers pays him 15 cents -- the amount he owed Chef Brockett from a purchase made in Episode 1199. A clip of Mister Rogers' visit to Mrs. McFeely is seen later in Episode 1618. 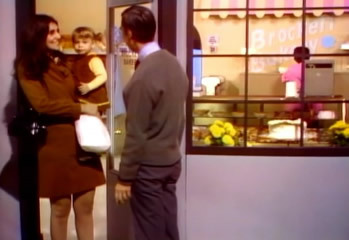 Leaving the bakery, Mister Rogers visits briefly with another customer -- Hedda Sharapan -- who is shopping with her nine-month-old daughter Amy. 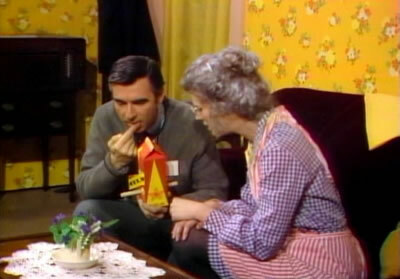 The detergent bottle puppet was originally made by Mister Rogers and Bob Brown in Episode 1186. Corney: We can make our stain from different colored earth. Robert Troll: That's the way the Indians used to make it. Corney: Sure. The Indians knew so many things that we need to learn all over again. Mister Rogers does not hesitate to taste some of the homemade birdfeed inside the McFeelys' birdfeeder.